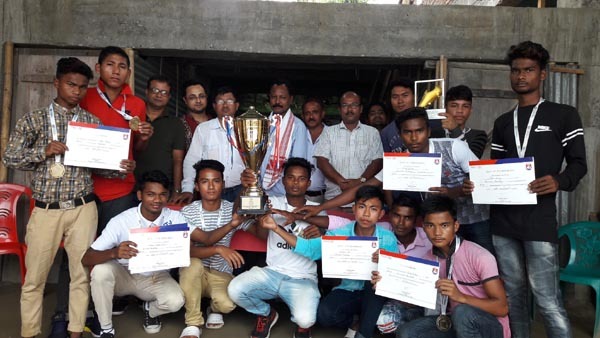 A private school Arunodoi Academy in Tangla, Udalguri organized a special felicitation event for budding players on Monday. The programme was organized to felicitate young football players who represented the school and emerged City Champions in Junior Category at the Reliance Foundation Youth Sports School, Football competition on December 8,2017 at Betkuchi, Guwahati. Journalist Shajid Khan attended as the Chief Guest of the function. Bhergaon District Sports Association, Secretary Bhupen Boro, Principal of the institute, Nepolean Daimari, Principal of Arunodoi Jr. College, Pranabjyoti Das were present at the event. Speaking on the occasion Khan lauded the efforts of the school to tap students potential in co-curricular activities besides excelling in academics. The school authorities as a token of love and appreciation distributed sports kits to the fifteen students. The kit comprised of a sports shoe and football boots each besides certificates and medals. The Reliance Foundation also provided a cheque amounting to Rs. 25,000 to the school authorities.